Are you thinking about Christmas yet?? Well, Hermie the Worm would delight any youngster on Christmas morning and all year long. Hermie: A Common Caterpillar by Max Lucado is a excellent book. I totally fell in love with Hermie from day one of reviewing him. Your child will learn that being common isn't always a bad thing. We all are special in God's eyes. God is working on them and isn't finished with them. These themes are much needed to help any child gain a healthy self-esteem. The illustrations are beautiful too. I haven't come across a Max Lucado book that I haven't fell in love with yet. Just can't go wrong. I'm sold. 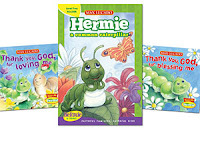 Be sure to check out the Hermie Prize Pack Giveaway here.